Is formal voting out for the count? In what’s been a whirlwind two months, the federal election was called (rushed forward), the campaign (war of words) run and finally, the election was held. Well, can we really call it an election? The pre-election mentality seemed to be ‘We’re going to get stuck with either Tony Abbott or Julia Gillard as Prime Minister, so (cue deep sigh)… come what may’. It hardly seems like we actively sought to elect anyone. Tony Abbott of the Liberal Party – He’s a misogynist, out of touch with most Australians and doesn’t have anything substantial to contribute to the political arena. 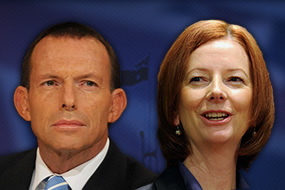 Julia Gillard of the Labor Party – She’s a woman. She stabbed PM Rudd in the back. And …she’s a woman! Bob Brown of the Greens – Well, they’re the Greens. Brown and the party are too focused on things like the environment and gay marriage rights. Not a great vibe for a Federal election. Election day came and went and more than a week later the election was still not won. Voting was close but another factor in the delayed result was the time spent eliminating high numbers of invalid votes. In an Inside Story report, it’s stated that that around 729,000 votes were found to be invalid (also known as informal votes). A vote could be deemed informal for numerous reasons, including failure to number all boxes on the ballot paper or defacing the ballot paper resulting in unclear preferences. Defacing could be a result of illustrations, possibly a ‘comedic scene’ featuring a candidate, or, as has happened many times before, one can deface a ballot paper using ..err, select words – it seems there’s free creative license in this type of informal voting. Another prominent voting trend in this past election was that of the donkey vote. This is essentially a thoughtless vote where the individual rocks up to their voting station and simply numbers the candidates in the order as they appear on the ballot paper. E.g. Candiate A , Candiate B , Candiate C  and so on. Maybe the individual feels they don’t know enough about the candidates to make a genuine vote. It could be a planned statement against the political parties. Maybe they just don’t care. For better or worse donkey votes are deemed legally valid (formal) and count towards final tallies. But, what’s done is done. Election time is over, right? Think again, friends, because while the hullabaloo that was the Federal election (and is now the Australian Parliament) sorts itself out, not one but two State elections are on their way! State elections are coming up this year in Victoria (27th of November) and in early 2011 in New South Wales (16th of March). With two and six months respectively to go, it gives the voters time to sniff out details on the policies and ideas of the political parties and their candidates. Official websites are good for getting to the guts of the party. They clearly state their stances on issues with consequences at local, state and federal levels. But, be prepared to wade through the usual political slogans and glossy ‘cute baby in shopping mall’ and ‘handshake with a hardhat on’ photos. On the whole, these sites are good for getting informed while avoiding the constant trash talking in the general media. Well, time’s a wastin’ NSW & VIC residents, so hop online, or rather… open a new web tab in your browser and check out a political site or two. Come election day share your valuable 2c with your state – your vote counts! Not enrolled yet? For details on how to enrol and the voting process, check out the Australian Electoral Commission website.